When it comes to using hardwood on your floor, you will be faced with the decision of choosing between engineered and solid hardwood. While they are both good choices in their own right, they each have their pros and cons. What’s the difference between engineered hardwood and solid hardwood? Obviously, solid wood floors are made from solid hardwood, with each piece of board being about ¾ inches thick. This level of thickness makes it easy for the floor to be sanded and refinished multiple times, for as long as the flooring remains in the house. However, one problem with solid wood floors is that they expand and shrink as the temperature in the house changes. For instance, when the air is drier during winter, hardwood floor will shrink. Conversely, during the summer or spring when there is moisture in the air, the floor will expand. If you plan on installing a solid hardwood floor in your home, make sure the installation is undertaken by a well trained installer, who knows the exact amount of space that allows for the natural expansion and shrinking of the floor as the humidity changes. On the other hand, engineered hardwood floor is made up of layers of wood, joined together with adhesive under intense pressure and heat. Because of the technical production process, engineered hardwood is not susceptible to a change in humidity, as much as solid hardwood is. This means that it neither shrinks nor expands as the weather changes. For this reason, many people consider it to be h3er and the better of the two options. Just like solid hardwood, engineered hardwood can be sanded, only not as much. In fact, engineered hardwood floors should not be sanded more than twice in their lifetime – and even that depends on the quality of wood. When it comes to choosing between solid and engineered hardwood for your floor, the choice will depend primarily on what you want to achieve. Many homeowners are interested in having the real thing, which only solid hardwood can provide completely. Solid hardwood comes with the natural look, feel and scent of original hardwood, without any chemical smell associated with it. Also, it’s easier to install and sand solid hardwood than it is engineered hardwood. Additionally, because solid hardwood is made from a single slab of wood, it tends to last longer than engineered or laminated hardwood. 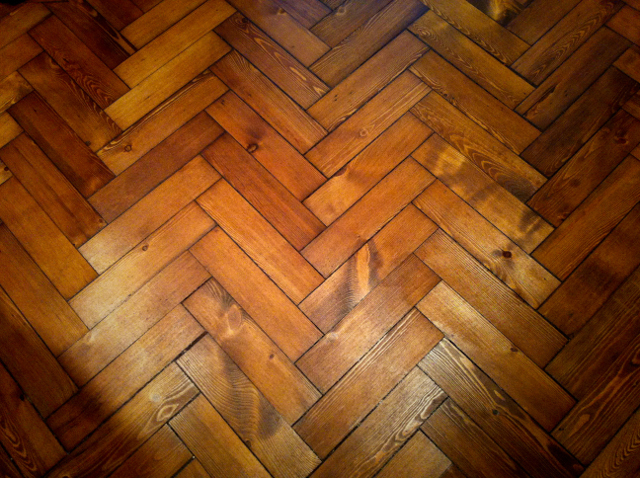 What are the drawbacks to using solid hardwood? While solid hard wood floors are more durable and therefore last longer, they are more susceptible to dents and injuries. In fact, dropping a heavy or sharp object can easily damage your floor – or at least give it a very obvious scar. Additionally, if solid hardwood is exposed to water for any period of time, it can swell and expand. This is why it’s not advisable to install solid hardwood in areas where water is constantly used, such as a bathroom or laundry room. Additionally, since solid hardwood floors are made from 100% hardwood, they tend to be a bit pricier than engineered wood, although the authentic look and glossy finish are well worth the high price. Because engineered hardwood is not made of 100% hardwood (rather, the top and bottom layers will most likely be made of hardwood veneer), it makes engineered hardwood floors the right choice for anyone looking for a floor that can handle moisture. Because this type of floor can work either in a damp environment or somewhere hot, it is ideal for homeowners who don’t want to worry themselves about the effects of temperature and humidity on their wooden floor. Furthermore, as engineered hardwood typically involves only a small portion of actual hardwood, the price is usually a lot cheaper than that of solid hardwood. In many cases, price has been the determining factor in why people opt for engineered hardwood. How hard is it to install a wood floor? Installing a wood floor can range between a somewhat complex DIY project to something you need a professional to handle. If you’re looking for a hardwood floor solution that you can install by yourself, you’ll want either the laminated or engineered hardwood. Both options come as prefinished products, which you can simply install by yourself whilst following instructions. Of course, you’ll have to consider temperature and timing in between placement, so that the floors will adjust properly to the room’s temperature and humidity when installing. If the engineered hardwood floor is a DIY project, it follows that solid wood floors have to be installed by a professional. For one thing, the sanding process is very tricky and can also be dangerous. Therefore, it‘s important to look for a qualified installer who has done this before. Nothing beats the original feel and authenticity of natural solid hardwood. However, as pointed out earlier, what you’re aiming to achieve will ultimately sway your decision. While you could opt for the original feel and texture of a solid hardwood floor, know that you cannot use this material everywhere if you’re concerned about the durability of your floor. While a solid hardwood floor will work just fine in just about every other part of the house, it’s not ideal in the kitchen, bathroom, laundry room or other areas where there is always moisture present. When it comes to these areas, using engineered hardwood would be the best bet. This means you’re looking at a combination of the two options, unless you plan on using a different floor type in the kitchen, bathroom and laundry room. More and more people are opting for hardwood floors in their home these days, with some going for solid hardwood and others engineered hardwood. Whatever hardwood type you choose, understand that installing a floor is not a typical DIY project. It takes a certain level of skill and expertise to get it right. Additionally, you might not be able to lay your hands on the right sanding equipment and tools needed to do a good job, so trying to do it on your own may cost you more in the long run. An expert on the other hand has the tools, resources and necessary expertise complete a thorough, professional job.